While this is not his first book, Boomsma believes it may be one of his most important. 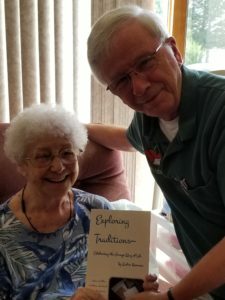 Betty Van Dyke accepts the “very first copy” of Exploring Traditions from Walter Boomsma, the author. Dyke explained the great influence she had during his “formative years” as a Grange member. At the height of her Grange career, Van Dyke held a number of local and state positions, including serving as the Maine State Community Service Director. At 94, Van Dyke still keeps track of what’s going on at Valley Grange and is a strong supporter. Boomsma will sign copies of the book at the 152nd Annual Convention where it will be available for sale. It is also available through the Grange Supply Store. Contact Loretta Washington at sales@nationalgrange.org or by phone at (202) 628-3507 ext. 109. The book is available through a number of outlets including Amazon and Barnes and Noble as well as the Grange’s National Supply Store.